Member of the Araceae (arum family). Native to Mexico and South America. 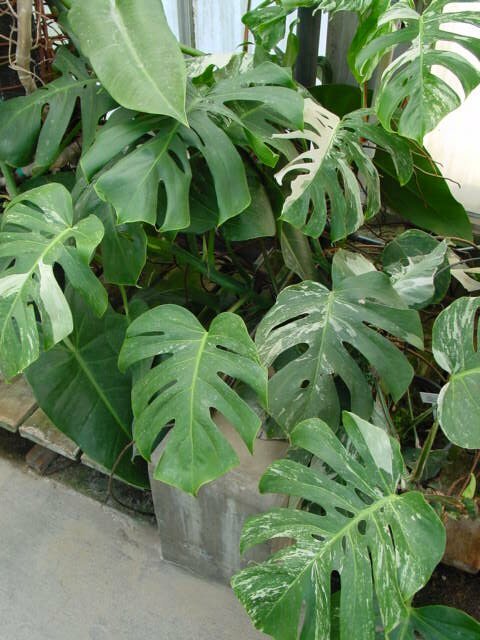 Common relatives include philodendron, calla, anthurium and pothos. Plant is classed as a monocotyledon. Leaves are leathery, deeply cut into lobes and often perforated, overall shape is oval. Stems have cord-like above-ground roots that aid in support. Chill sensitive, store above 55 degrees F.
From the Latin “monstrum” (a marvel) or monster, possibly in reference to the shape of the leaves. Several arum family members (including taro) are grown in tropical regions for their edible tubers, representing starch staples for large populations. Many other species are grown for their beautiful foliage. Will generally grow well in light levels bright enough to read a newspaper in comfort if properly light acclimated prior to placement inside. Fruits are edible which probably is related to its specific epithet name “delicosa” which means delicious.